The second offshoot in Yianni Papoutsis’s ever-expanding empire, this rough and ready burger bar has been drawing fans to the tatty Jubilee Market since 2012. Meat Market is closer to Papoutsis’s street-food origins than its elaborately themed siblings Meat Liquor in Soho and Meat Mission in Hoxton. The menu is tacked up in wonky plastic lettering, orders are taken at the counter and tables are separated from the market below by plastic sheeting. The entrance is hidden up some back stairs; with its loyal Twitter following, the restaurant doesn’t need to capitalise on the tourist market. The shop’s classic burger, the ‘dead hippie’, was exceptionally juicy – quite an achievement when arriving as two thinner patties. Sadly, the secret-recipe sauce lacked impact and the skinny fries were unremarkable. Better was a side of poppaz: croquettes filled with molten cheese and tongue-numbingly spicy jalapeños, served with a dill-heavy ranch dressing. While such dishes were trailblazers a year or so ago, burger mania has since shot through the roof. It will be interesting to see how Meat Market retains its niche alongside Five Guys and Shake Shack, Covent Garden’s latest opinion-dividing American imports. Words cannot describe my love for The Dead Hippie burger at MEATmarket. It has to be my favourite burger in London. The fact that you can get it quickly and in a take away style is just perfect. The prices are reasonable for how good these burgers are, and sure, the place isn't the prettiest to eat in, but that adds to the charm of it! I'd suggest if you indulge in their chilli cheese fries (AND YOU DEFO SHOULD!) get them to share with a pal. The burger and a whole portion of those bad boys will definitely quench even the largest of appetites! The dead hippie has always been (and likely always will be) my favourite burger in London. 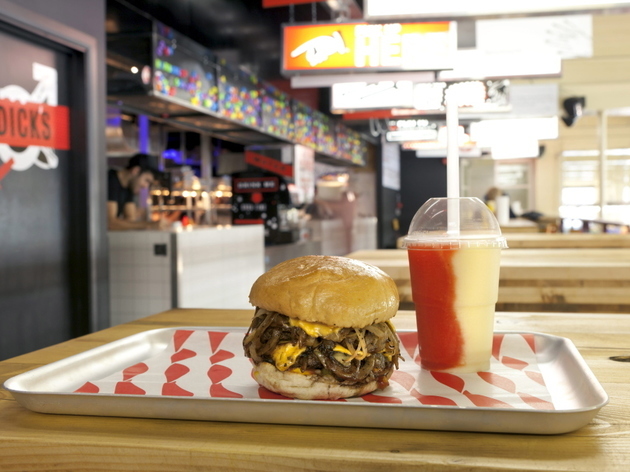 The one served at Meat Market is just as good as Meat Liquor, just quicker and in a take away style! A far better option than Five Guys and Shake Shack. Food is always quick, staff are friendly and the price isnt too bad! It isn't as cheap as Maccie D's but if you want one of those go to Charing Cross Station! Amazing burgers! Inventive side dishes, super friendly staff and all at a very pocket friendly price - also all the meat and none of the long waits! What more could you want!? Top off with a craft beer tinny on the side, or sample the 'lagerita' on tap, and you've got yourself a damn fine meal my friends. I couldn't recommend this place more. Great burgers and a slightly different menu to the standard burger joints including a good selection of veggie options too! Prices are a little expensive for what you actually get but it’s definitely worth hitting them mid week for their £10 lunch deal! Yummy yummy indulgence in my tummy. I had monkey fingers (fried chicken strips) and fried pickles both with blue cheese sauce. Absolutely delicious. The staff are friendly enough with a sizeable helping of attitude at times. The menu is displayed on an intense red lit board which actually hurts your eyes if you read for too long (note: there are paper menus by the till so just pick one of those up instead). The seating is high benches with stools and can get really busy quickly. Be prepared to sit with other diners or get their before/after the rush but definitely go, it's a greasy treat. Meat Market does what it says on the tin and is perfect if what you are looking for is, well, meat. Especially if that meat comes in the form of a sloppy, messy, get-stuck-in burger. I love meat market - from the stark interior to the wooden, sharing benches and the alcoholic slushy machine, but I realise this might not be everyone's cup of tea. From an indulgent lunch to late-night feast there is no occasion I can't imagine not wanting a treat from here. I can wholeheartedly recommend the green chilli cheeseburger - two scrumptious beef patties coated in cheese, spicy chili butter, red onions, pickles, lettuce, French’s mustard and ketchup. Word of warning, don't wear white. The famous dead hippie is always a success as well. How can you resist tucking into two French’s mustard-fried beef patties, dead hippie sauce (which I think I would coat all food with if it were possible), lettuce, cheese, pickles and minced white onion? Alongside the classic fries, make sure to get the fried pickles with blue cheese sauce, and the poppaz (deep fried jalapeños) on the side for a full Meat Market experience. And, if you're feeling particular ravenous, the dead hippie fries topped with more of that mouth-watering sauce. For filling your meat-fulled cravings, this is the place to be. 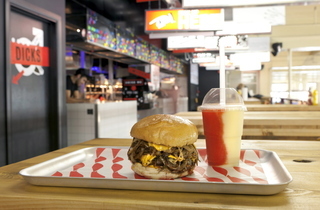 I've wanted to taste a dead hippy burger since Meat Liquor first started its empire in London and on Saturday night after a show we walked past Meat Market's doors and finally stepped inside. Big mistake. Greasy greasy burger, cold and bright interior with blaring music and no atmosphere. Your onion rings were pretty special but the overall experience was soulless and the burger literally just tasted of pepper. As in salt and pepper. Maybe it's better when it's busy but I won't be going back here to find out. The best burger joint by far! Forget over priced Shake Shack and over salted fries at Five Guys. Bf and I both went for a burger ( dead hippie for bf and black palace for me) both double patties with slightly different toppings. Mine was incred! Lots of onions and cheese and buns also v good! Bf also enjoyed his but mine looked better. We also ordered the deep fried Mac n cheese and the chilli cheese fries. Mac n cheese were really nice! As were fries because of the chilli cheese and jalapeños (be warned quite spicy) but the chips them selves were pretty average and I wouldn't recommend getting them plain as a side! No desserts available but I was so full after there was no need! Will definitely be going to another branch to try it out (v similar menus) and would go back! The portions here are huge. When your order a side of chips its definitely enough for two people. The burger was pretty good, not the best I've ever had but there is a lot of competition in London. Came very quickly and seemed more like a fast food joint than the restaurant I thought it was. Still pretty good though and not overly pricey. A friend recently introduced me to the awesome Meat Market and it didn't disappoint. The beef burgers are great but if the fried chicken burger is where this joint really stands out - best fried chicken I have had for a very long time! The burger is amazing definitely one of the best I've ever had. However I'm kinda over the whole table sharing order at the counter places which are taking over London at the moment. Great place to jump in for a tasty meal on the go, but not the place to go to sit and enjoy a meal with friends. Ridiculous place!!! I asked to substitute the cheese in one of their burgers that I am allergic to and was told 'NO WAY'. The guy said it is because each sandwich is a 'taste sensation' and cannot be altered. In a big contradiction the guy told be that they can take out the cheese or any other part of the burger but they cant 'exchange' anything. So if I take out the mushrooms or sauces, doesn't that change the taste???? If you have allergies of any kind this place will not accommodate you. They are more in love with their pretentious company babble than customer service. Christmas Burger #2 of 9. This continues my challenge to eat all 9 burgers listed in the TimeOut blog. I would put this as the first 'Christmas' burger, as it is turkey (the one from Bird was chicken). I love the Meat * chains and it was hard to not go for the Dead Hippie but I stayed strong and ordered the XXXmas Burger. We also had a an order of fries and deep fried pickles. Lets get the sides out of the way. The fries are nothing special but they are oh so tasty, being perfect carriers for blue cheese, ketchup, or dead hippie sauce. However, you would be a fool to NOT order the deep fried pickles. I think you get 6 decent size spears in a bag with a side of blue cheese. Rip the bag open and enjoy-- just watch out as they could be piping hot! Hot pickle burns in your mouth are not fun. The burger itself reminded me of a breakfast butty, which is not a bad thing. Generous heaping of sliced turkey, a nice sausage and sage stuffing patty, and circular bacon (how did they do that?!) with a decent bit of gravy. The gravy could have been dangerous as too much could ruin the structural integrity of the burger itself. However, it was necessary as the turkey itself would have been too dry without it, even with the cranberry jelly. Favourite burgers are the Dirty Chicken Burger and Dead Hippie, also can’t resist a side of Chilli Cheese fries or Poppaz. So, if you’re after a good ol’ tasty American burger in Covent Garden, look no further. Me Man. Me like meat. Me like Alcohol. Me like Meat Market. Me like juicy burger and hippie fries. Me like spicy chicken wings and blue cheese sauce. Me like very much LARGERITA!!! You no like Meat Market? Me no like you! After finishing the London marathon (well not just after, it took me two and a half hours to leave the vicinity due to my knees refusing to bend) I knew there was only one kind of food that would cut it and that was a burger. Cue MEATmarket, the middle of the three MEATliquor brothers (I could already relate to their hard-up middle child existence). The restaurant itself is a tad dilapidated on entry (and kind of inside), but I wasn't there for first rate decor of course. I ordered a standard cheese burger - I am a firm believer that burgers should never be inexplicably accessorised. The meat was perfectly cooked but a tad unseasoned. It held together well though - and because I presented my marathon medal I also got it for free, so whose to complain about salt and pepper really? The fries weren't much to write home above, but that's probably because I had been gunning for sweet potato fries. The onion rings were an absolute treat. Overall, the food was pretty decent, although it did take me 20 minutes to get off THE most uncomfortable stall I've ever rested my derriere on so I'd probably recommend getting a cab there rather than running all the way from Greenwich. If you want a good burger in covent garden but don't want to suffer the throngs of hungry people waiting to get into Five Guys or Shake Shack then this hidden gem around the back of the market is ideal. Been to meatliquor and loved it, but this, as the other reviewers have alluded to is just not the same and left me wishing for more. I had the philly cheese steak and chilli fries. The cheese steak was just overly onioned and the chilli fries were good, but just didnt seem as good as those from meatliquor. The beers on offer were awful, plain old lagers that all taste the same. Get some decent beers on, get rid of some of the onions and it should be better. Heard good things and left disappointed. The fries were expensive and covered in too much salt, they're nothing above fries you're getting in McDonalds or KFC. I had also had the "dead hippie" burger (I think) and again, too much topping (cheese) which completely devoid the consumer of tasting any meat. I enjoyed MEATliqour, so to come here was a bit of a shock. Wouldn't bother. Perfect whilst it remains a hidden gem. Nice to have them closer! burger and poppaz was really awesome, best tasting burgers I've had in London. Beware girls, I can never normally finish a big burger, but this tasted so good that I sat for an hour and willed myself to finish it - but the rest of the night as well as this morning I've been suffering! so it is great, but don't let that blind you to your stomach's capacity! Good, but did not live up to the hype. Ordered the Black Palace Burger. The meat was a little hard and chewy, quite greasy (I suppose it was fried). Much better quality meat at Byron, and char-grilled, which I prefer the taste of. The fries were about 3x too salty. All that being said, it wasn't terrible, was actually pretty good, just not as good as I was expecting and a shame that a big chain like Byron produces better tasting burgers. overpriced and too cool for school im afraid 21 quid in total for a hot dog ( the ripper) so deep fried impossible to bite through and with no cutlery you go hungry! burger was ok but not the best,poppers and fries. seats available were duly lacking and fill refills on the soda only good thing as we shared a drink but still look at the cost! wont be returning! Seriously overhyped, soggy crap. Had better in a 80s fish and chip shop and felt dirty afterwards. This kind of food should stay in a van beside the road where it belongs. It tasted no better than McDs, fell apart, dripped and tasted only of onions. There seems to be a ridiculous trend of making things as unhealthy and unruly as possible, more a statement than a meal. The fries were bland and totally overpriced (£3) and at the till they offer those or chilli fries, not mentioning anywhere that chilli fries are actually chilli con carne in a long aluminium tray, layered with fries then layered with cheese and mustard. A meal for two in itself and not something that should be offered as an alternative to plain fries. We sent those back. Cheeky up-sell. Whoever writes these positive reviews needs to raise their standards. Hopefully the quality of food will then follow. But it's trendy right! The con rolls on. I thought it was really bad. The burger was huge but the meat was tasteless. It left you with that phlegm-y feeling afterwards but without the 'burger thrill' you normally get. Atmosphere wise, it felt very 'ironic hoxton' and the vibe was not conductive to a nice dining experience, it felt a bit hollow and like you weren't really in on the joke. It was hugely expensive too we felt ripped off after we left. It felt like going to Wimpy but triple the price! Also I saw one of the staff who was cooking the food digging his teeth. AVOID.